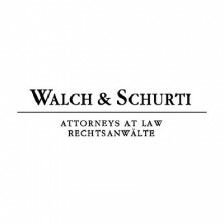 Walch & Schurti was founded by Dr. Ernst Walch and Dr. Andreas Schurti in 1991 and operates under the name of Walch & Schurti Attorneys at Law Ltd since February 2015. Since 2005 Dr. Alexander Appel, Dr.Andreas Vogel, Dr. Moritz Blasy, Marina Haase and Dr. Barbara Walch became additional partners. Walch & Schurti Attorneys at Law Ltd. is an international commercial practice with strong links to the USA, Great Britain, Switzerland and Germany. The team’s lawyers were trained in several jurisdictions (Austria, California, Germany, Great Britain, Liechtenstein, New York, Switzerland). During the past decade, the firm became one of Liechtenstein’s leading law firms and developed a strong litigation department. Focus on the highest quality standards and the resulting ability to meet client demand for comprehensive advice in times of increasing regulatory requirements in the financial sector and other areas, such as telecommunication, tax and international legal assistance have contributed further to the success of the firm. Walch & Schurti Attorneys at Law Ltd’s legal team regularly advises major banks, insurers, investment funds, industrial companies and private individuals. In close cooperation with WalPart Trust Reg., the firm meets the needs of the international client in Liechtenstein. It advises, prepares agreements, opines and conducts litigation primarily in the following areas: contract law, corporate and commercial law, banking and finance, foundation and trust law, estate planning, asset protection, insurance, mergers and acquisitions, bankruptcy, company formation, intellectual property, white collar crime.